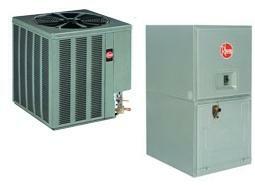 Rheem Value Series 14.5 SEER Condensing Unit Outdoor Featuring R-410 Refrigerant. When you look at the benefits provided, youll see that you can depend on Rheem Condensing Units to deliver the quality and value you expect. Efficiencies up to 16.50 SEER / 14 EER Nominal 1.5 to 5.0 Ton Cooling Capacities Durability for Years to Come While blending effortlessly into your homes landscape, the attractive, low-profile, louvered, Neutra Green steel cabinet provides style and protection from yard hazards and weather extremes. With this durable construction, you can count on years of ease when you depend on Rheem for your home comfort needs.